One week from the release of WWE’s history-making, first-ever Women’s DVD “Then, Now, Forever: The Evolution of WWE’s Women’s Division” (hitting the UK next Monday via Amazon.co.uk and the USA next Tuesday via Amazon.com) it’s time for your exclusive first look! Today, WrestlingDVDNetwork.com presents photos of the final packaging you can expect to find in stores next week and a sneak peek at the DVD’s intro video too. “Then, Now, Forever: The Evolution of WWE’s Women’s Division” is a compilation of 22 matches involving the most influential, ground-breaking and legendary female WWE Superstars and Divas to grace the squared circle. Those matches include many “firsts” for the division including the first-ever women’s cage match in WWE and the more recent women’s Money in the Bank, Hell in a Cell, Elimination Chamber and Royal Rumble matches – and yes, the Rumble is shown in full! 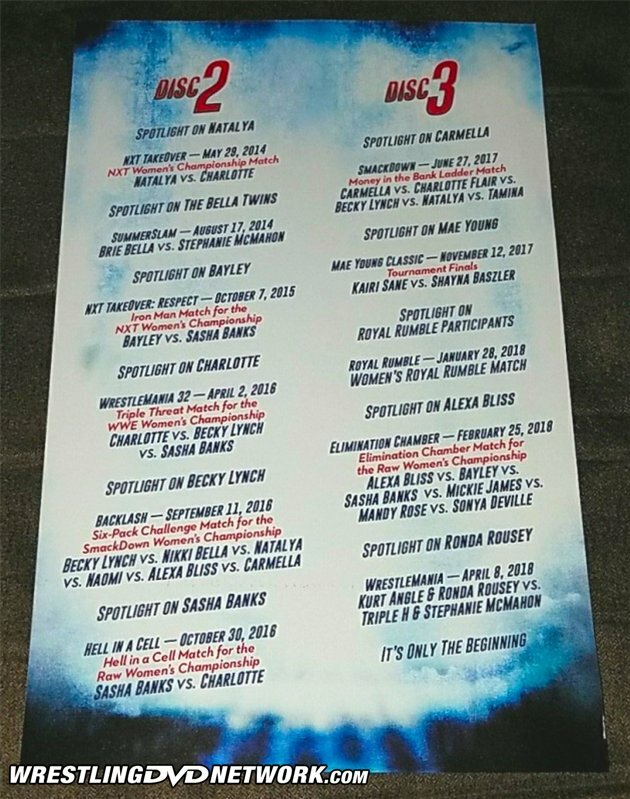 In between every bout will be documentary-style chapters that “Spotlight” more than 20 different performers including Mae Young, Wendi Richter, Sensational Sherri, Alundra Blayze, Ivory, Victoria, Lita, Molly Holly, Trish Stratus, Mickie James, AJ Lee, Paige, Natalya, The Bellas Twins, Bayley, Charlotte Flair, Becky Lynch, Sasha Banks, Carmella, Alexa Bliss and Ronda Rousey. As is now the norm, the U.S. release is housed in standard Amaray packaging that’s slimmer than the Digipaks we traditionally saw produced for a 3-disc set. A paper insert is found inside the case which details the full content of the discs, while those discs are again ‘stacked’ together in one holder. Let’s take a closer look! Thanks goes out to WDN reader @jayjayrock206 for the pics. Every week, the women of RAW, SmackDown Live and NXT are breaking barriers while stealing the show at WWE events all over the globe. Now, see how it all began with Then, Now, Forever: The Evolution of WWE’s Women’s Division. 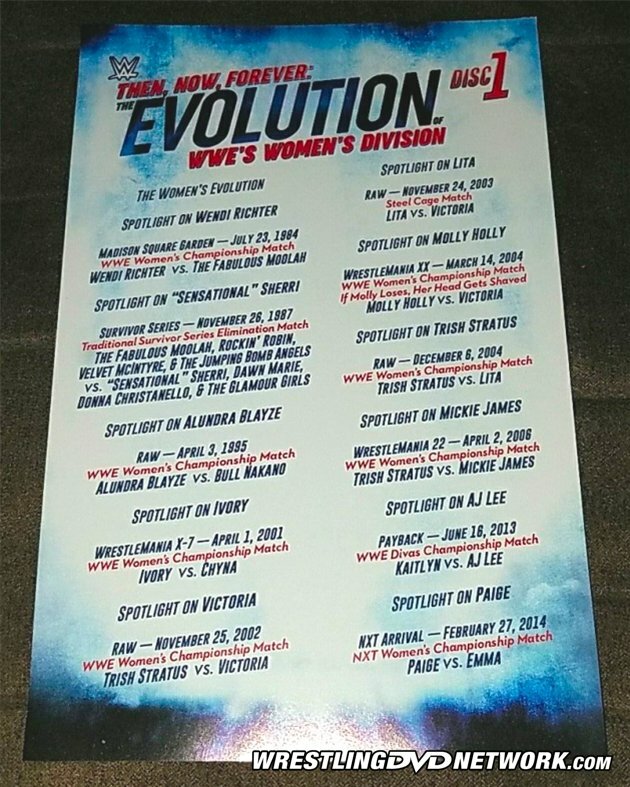 From trailblazers like Alundra Blayze and Chyna, to pioneers like Lita and Trish Stratus, all the way to today’s awe-inspiring athletes such as Charlotte Flair, Sasha Banks, Bayley, Alexa Bliss, and Asuka, the revolution was indeed televised, and you get to witness it all right here with some of the greatest and most groundbreaking women’s matches of all time. From Wendi Richter to Ivory to Becky Lynch to Ronda Rousey, see how these amazing women helped shape the landscape of WWE today! DISC 1: 2 hours and 49 minutes. DISC 2: 2 hours and 56 minutes. DISC 3: 3 hours and 6 minutes. – UK/Europe: Next Monday! Pre-order the WWE Women’s DVD right now on Amazon.co.uk. – United States: Next Tuesday! Pre-order the WWE Women’s DVD now here on Amazon.com. – Australia: TBA. Your pre-order opportunity will be announced soon via Madman.com.au. Is this set likely to be released in digital HD anywhere? I’m a huge fan of women’s wrestling, absolutely love the idea of this set, but come on. DVDs are obsolete. Why on earth would anyone be content with SD when we have HD? It’s like choosing VHS over DVD. I understand the Blu-Ray licensing costs, but if it’s too expensive to produce physically, they should at least release it digitally in HD. It most likely will be. Just about every home video is also released on digital HD. Really? Where? I’ve looked for recent releases on iTunes, Amazon Video, WWE Network etc, but I’ve not been able to find a single release from the past couple of years. It looked to me like they stopped releasing digital HD a few years ago. iTunes, Amazon, Vudu, etc. still put up new releases, usually just PPVs and documentaries, not so much for match compilation releases. At least not that I’ve seen recently. You have to type in the exact title instead of just typing in “WWE”. They got monkeys running the home video department. Millennials. Those monkeys are millennials. I guess WWE figures if stacking is good enough for Pringles chips, it’s good enough for their DVDs. Even the disc’s are identical with recent sets. These look very similar to the Randy Savage and Hardys DVDs, same generic design, color, etc. the decreasing dvd/bd sales have become sort of a self fulfilling prophecy. like if they put less effort into it (which they seem to), of course chances are that sales are going to be going down. I still prefer the disc have their own slots rather than stacking them up. Easy to break and scratch the surface of it. Lazy packaging. Well IMO scratches only happen through lazy handling of the DVDs by the owner. Just treat them with care when removing. At least its better than the cheap crappy cardboard packaging they had with discs housed in slots with the back rubbing against the cardboard. The 3 Disc Kane DVD, Summerslam and Survivor Series Anthologies were packaged this way. They were guaranteed to have surface scratches on them when pulling out. However, i think in later prints they fixed the packaging with the Kane DVD using the regular case with the flipper. Love the trailer but the fact of stacking discs on top of each other is VERY appalling. You can accidentally break one or 2 of the disc. I’m picking this up but i’m going to’WWW.E-BAY.COM’ to buy a new 3 discs holder. This is ridiculous. Literally never had one of these “accidents” with this style of packaging. Maybe it can happen if you rip them out with reckless abandon, but then that’s kinda your fault. Am I the only actual person on here who looks after their stuff, because the general reaction to this packaging has been so needy-sounding? I’m actually blown away by how much of a problem this seems to be for everyone. Are people really that ham-fisted when handling their DVDs? You seem to harass anyone who complaines about the Warner distribution of WWE DVDs. Why is that and why does it bother you so much? Your endless defence of Warner/WWE is very odd and I can’t seem to figure you out, unless you are just a major troll with too much spare time. But in the same token, my original point is why does the packaging bother everyone so much when they could just treat their belongings with consideration? So you’re asking why does it bother me so much; I’m asking why does it bother them so much. The answer is we’re both allowed to ask that question, and you don’t get to dictate what I’m allowed to say. So … yeah. Getting it even though I still dislike the idea of stacking dvds. Agree. It’s just a cheap move. FULL CONTENT: WWE WrestleMania 35 DVD/Blu-Ray Includes RAW After ‘Mania, Dean’s Farewell, More! REVIEW: WWE ‘Best of NXT TakeOver: 2018’ DVD – This Is Awesome! This Is Awesome! WWE Producing THE UNDERTAKER DOCUMENTARY, ‘NXT TakeOver: New York’ DVD, ANDRE This Month! First Details on WRESTLEMANIA 35 DVD & Blu-Ray, Trailer for WWE’s Next Cena DVD, NXT Tomorrow!